Albert’s Garden is located at 16-18 E. 2nd Street, between Bowery and 2nd Ave. close to the Broadway-Lafayette/Bleecker Street subway stops and the 2nd Ave. stop on the F line. OPENING SOON! Will reopen around April 1, 2019. 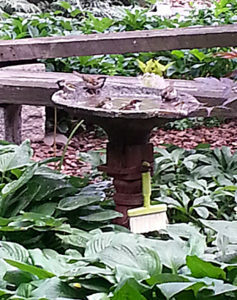 Albert’s is a quiet neighborhood place to admire nature’s beauty. 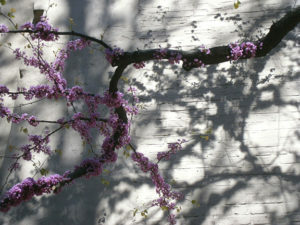 Begun in the 1970s, it’s now a mature shade garden where perennials unfold throughout the seasons. In this calm serene space, visitors can enjoy bird watching, linger near the gold fish pond, enjoy a wall mural by famed street artist, Roa, and attend community events ending with our annual Halloween Party. Photography is encouraged. Peacefulness prevails. NEW MEMBERS ARE WELCOME! Inquiries can be made through our website Contact Us page or just drop by to chat with any member when the garden is open. A. Provide stewardship for the maintenance, conservation and preservation of land as a shade and serenity garden for benefit of the surrounding community and the general public. B. 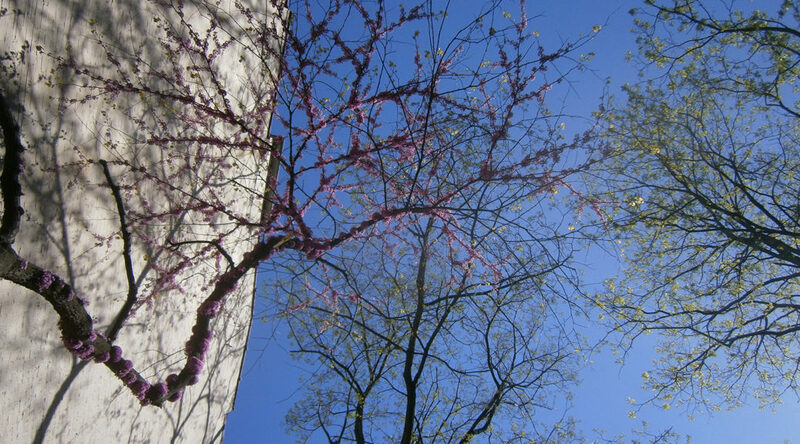 Develop awareness of green space ecology. C. Enhance environmental quality through horticultural insight. D. Promote community health and integrity. E. Stimulate and encourage activities which foster nature related education as well as artistic and cultural endeavors. F. Be a sanctuary for flora and fauna. 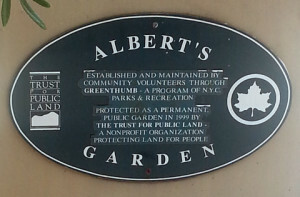 Albert’s Garden is a member of the Manhattan Land Trust, Inc. 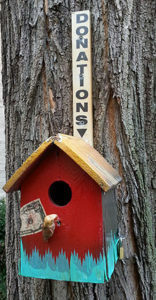 The property was purchased in 1998 by the Trust for Public Land at city auction along with 80 +/- other community gardens throughout four boroughs of New York City. Those gardens were subsequently organized into the Bronx, Brooklyn, Queens and Manhattan Land Trusts, each of which are independent entities. Albert’s became incorporated as a not-for-profit 501c. (3) in 2014 (EIN No: 47-2003727) and is registered with the New York State Charities Bureau. We receive no support from any public agency – federal, state or local. We have no political or religious affiliation. Our sole purpose is to provide a quiet respite for the general public in order to foster appreciation of and education about the natural environment along with science and the arts. Read more about the Garden’s History. Our members are all non-compensated volunteers whose dues go entirely to garden support. Your donation will assist in covering the garden’s annual expenses of insurance, utilities, the purchase of compost, mulch and fertilizers we cannot make ourselves, tools and materials for upkeep of the physical grounds, annual plantings, and food and aquatic supplies for our fish. We also participate in the TD Bank Affinity Program to help defray our operating costs. See how you can help us FOR FREE! Website photos contributed by John Shuttleworth, E.Jay Sims; historical photos contributed by Constance Barrett.